Let’s get right to the point: the answer is “yes.” In fact, any polymer-based product or material you own will suffer from polymer degradation, which is a change in the properties of the material or product. It’s caused by constant exposure to heat, light, and certain chemicals, including alkalis and acids, and typically results in changes to the material’s tensile strength, color, and shape. In basic terms, polymer degradation a process of aging. Just as sunlight and exposure to chemicals take a toll on the human body, it does the same for cars and other products made with polymers. Polymers are materials made of long, repeating chains of molecules. Some polymers, such as rubber and wood, occur naturally in the world. Others are made-made (synthetic). Depending on the type of molecules and how they are bonded, polymers have unique properties. Some bend and stretch, while others are hard and tough. The modern world is full of synthetic polymers because they are so versatile. You can find them in products ranging from nylon stockings and clothes to shopping bags, PVC plumbing, and car tires. What makes synthetic polymers so useful is their ability to combine strength, flexibility, chemical inertness, and resistance to outside elements into many different materials. For example, many polymers are strong and hard yet also flexible – properties that don’t usually go together. Within the auto industry, polymers are large manmade molecules that are chemically bonded to create materials for various auto body components. Engineers use them to improve the vehicle’s appearance, flexibility, and functionality. Auto polymers include vinyl, rubber, and many different plastics, and are typically use in bumpers, spoilers, air dams, and other aerodynamic features. They are also used in the black trim around windows, windshields and fenders. You may be surprised to learn how many polymers are used in the production of today’s automobiles and trucks. Most people know that their car’s exterior paint uses a polymer coating to highlight the color and gloss while forming a protective layer against the environment. Yet, the interior of the car contains many polymers as well. These include plastics in the dashboard, steering wheel and consoles, fabrics used in seats and more. The only problem with polymers is they tend to break down faster than the surrounding metal body panels when exposed to sunlight and other elements such as air pollution, oxygen, dirt, grime, and oil. Thanks to the same celestial body that makes life possible on earth – the sun – all polymers are subject to degradation, including those in your car. When exposed to excessive sunlight, which is full of ultraviolet (UV) radiation, the color, shape, and tensile strength of polymers begins to change. This process goes by several names, including photodegradation, photo-induced degradation, and UV degradation. No matter which name you use, the process is the same. UV radiation attacks the polymers in your car, causing them to crack or disintegrate under constant exposure to the sun’s rays. A car’s exterior paint offers a perfect example of polymer degradation. As the polymers degrade they begin fading in color and losing their glossy appearance. The coating loses strength and flexibility and begins to crack. It’s ability to resist scratches also declines. The rate at which the degradation occurs depends on the amount of UV light that gets absorbed. The more UV attacking the paint, the faster the chemical bonds in the material will break, leading to bleaching, fading, and cracking. Contrary to popular belief, the protective layer of coating on top of the paint does not prevent photodegradation; it simply slows down that rate at which it occurs. However, UV light isn’t the only culprit. Air pollution, oxygen, dirt, grime, and oil also contribute to breaking down the polymer bonds in the coating, eventually leading to brittleness and cracking. This same process occurs with every polymer material in your car. Long-term exposure to UV rays causes fabric materials to fade and lose their color, strength, and flexibility. It can also lead to cracked trim or molding around windows and wheel wells. 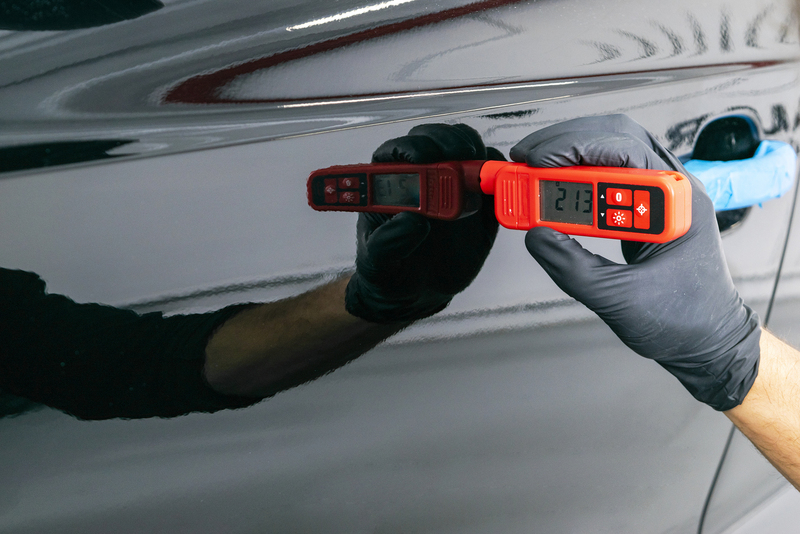 Infrared heat can dry out interior vinyl and other plastics, such as dashboards and consoles. Fortunately, there are steps you can take to slow down and even prevent the polymer degradation process. It takes a certain amount of time, money, and “elbow grease.” But, your car will look better and last longer, making it well worth the effort. Most car owners start with protecting the polymer coating on the paint. The most effective treatment is also the easiest – avoid the sun as much as possible. Park in covered areas at shopping malls and public garages. Park in a garage at home and in the shade at work (avoid trees that drop sticky substances). If this isn’t possible, use a car cover. Next, get in the habit of applying a protective coating on top of the outer layer of the paint. In other words, wax your car on a regular basis. Carnauba wax is considered the gold standard, but there are many good liquid and synthetic waxes as well. Also, keep the plastic, rubber, and vinyl surfaces of your car free of dirt, dust, grime, and other debris, and apply detailing products based on the type of the material. 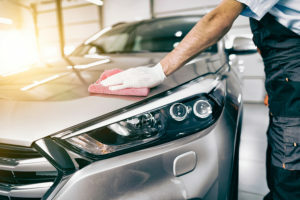 If you don’t have the time or inclination to put in the work, many gas stations, garages and repair shops offer professional detailing services to keep your vehicle looking good while arresting the polymer degradation process. When washing your car, avoid detergents that are too harsh for polymer materials, as this can actually speed up the degradation process. The same goes for detailing products. Look for quality products that state on the label they are safe for use on polymers. If polymer degradation of your car’s paint has it looking old and worn out, you can always bring it into your nearest Fix Auto shop. Our expert auto body paint professionals will determine the extent of the damage and offer a paint and detailing solution to get your car looking like new again.